Lots of stuff going on in the next few months with The Parties! First, we'll be playing a Free Show on Saturday, October 16 at The Burrit Room in the Crescent Hotel! This is a fairly new live music venue near Union Square in San Francisco. 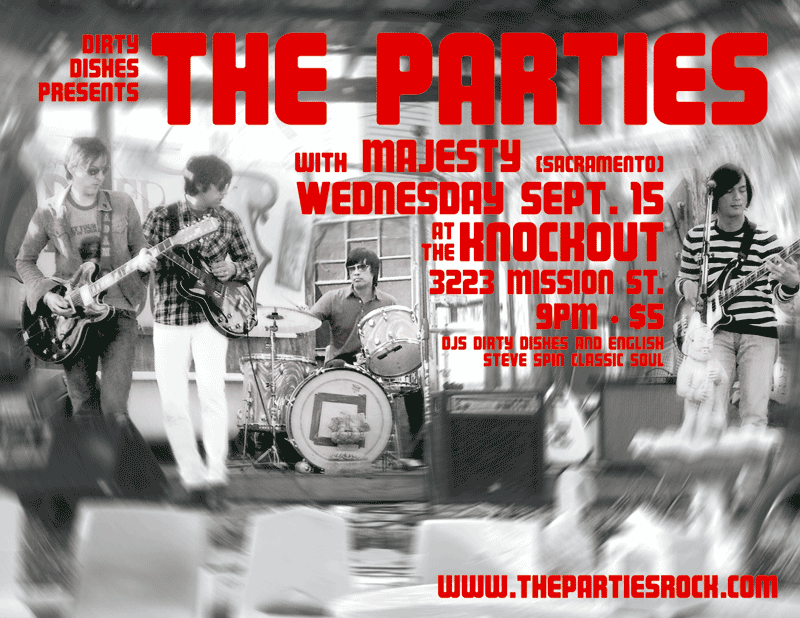 There will be dj's, cocktails, & dancing as well as Live 60's Rock n' Roll. Our new full-length album "COAST GARDE" will be released on Tuesday, November 2, 2010 on Rainbow Quartz. We are preparing a special website with tracks from the new album that you can preview before it comes out. Stay tuned. The Parties tune "Kensington Avenue" is featured on the latest Shindig Compilation free with this month's issue - Shindig! 18 Sept-Oct 2010, Out Now!